With the tactical scope being so popular and broad, you can find quality options for optics that do not cost a fortune. The Primary Arms 3X Compact Prism Riflescope is a budget-friendly option for people looking for optics for action shooting competition or home defense. 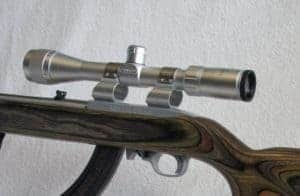 This scope is ideal for bug out rifles as well. It combines the quality of both magnified and red dots optics. At 1.6 pounds and 5.56 inches in length, this compact prism riflescope from Primary Arms comes with a five-slot section of Pic rail for easy installation of an extra unmagnified optic. The scope’s glass-etched Advanced Combined Sighting System (ACSS) offers markers for range estimation, bullet drop compensation, moving target leads, and wind correction, for either 7.62×39 mm/.300 Blackout or 5.56 NATO chamberings. Virtually all prism scopes offer a fixed magnification of between 1X and 5X. They are also compact such as a red dot, but the use of an etched reticle means that they can function even in low light condition. Additionally, the reticles are adjustable for focus and can be more complex. Primary Arms is known for quality, yet affordable scopes and red dots, including many models of prismatic scopes. The Primary Arms 3X Compact Prism Riflescope is in its own class when it comes to reticles. To begin with, the Advanced Combat Sighting System reticle is such a beauty. The large donut allows for easy sight acquisition, while the center dot lets you take precise shots at range. The range-finding nature of its reticles is extremely intuitive and useful; it doesn’t make your sight picture too busy or cluttered. The scope is designed to be zeroed for a hundred meters. The width of the large horseshoe is about 18 inches at 100 meters – this is the average width of a man’s chest. The opening at the lower end of the horseshoe corresponds to the distance across the 300 yards. The optical clarity is amazing, and the eye relief is very forgiving. We can sum up the reticles of this prism scope with two words; crisp and sharp. The Primary Arms 3X Compact Prism Riflescope is powered by a single CR2032 battery and has 11 brightness setting. The point here is, in bright sunlight, the unit’s fiber optic controls the light penetrating the lens thereby enabling you to see clear images. At night or in low night condition, the lowest illumination setting (number 11), enables you to see the reticle in blackness without being too distracting or bright. The Primary Arms 3X Compact Prism Riflescope is ideal for sport and tactical shooting. The ACSS reticle provides wind holds, quick ranging, and moving target leads options all in one easy-to-use system. It is extremely durable as it is designed to handle extreme weather condition and heavy recoil. With a three year warranty, you can have guarantees that this is a quality equipment. 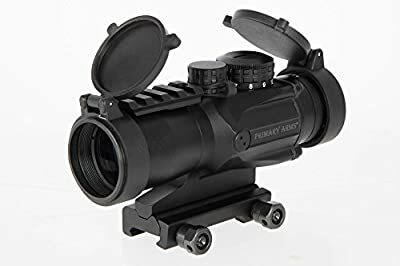 With 12 brightness settings, you can use this prism scope in any light condition; either too bright or low light condition, you will see your target with great clarity. We can highly recommend it to any shooter or hunter who is looking to improve their accuracy.